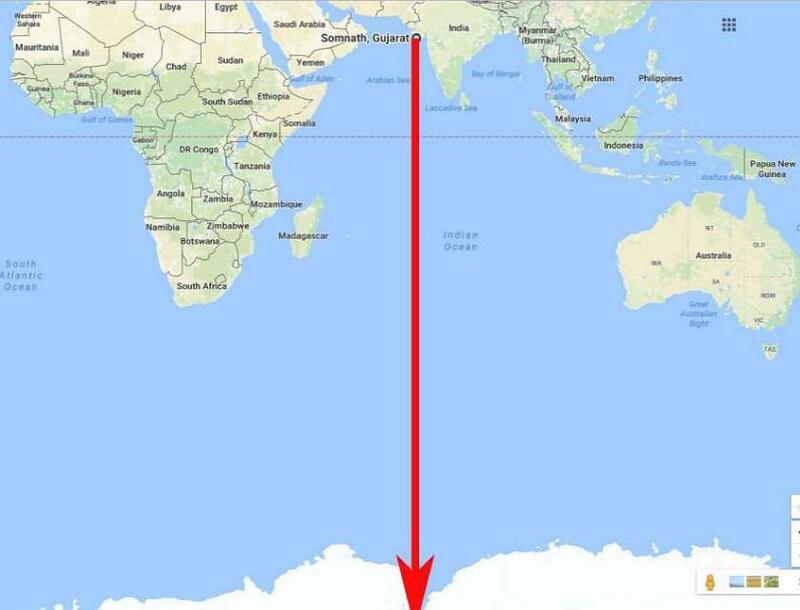 Somnath Temple to Antarctica, a straight line can be drawn with no land in between. This was inscribed on a pillar (Baan Stambha) atleast since 7th century CE, which proves that Indians knew about South Pole much ahead of others. 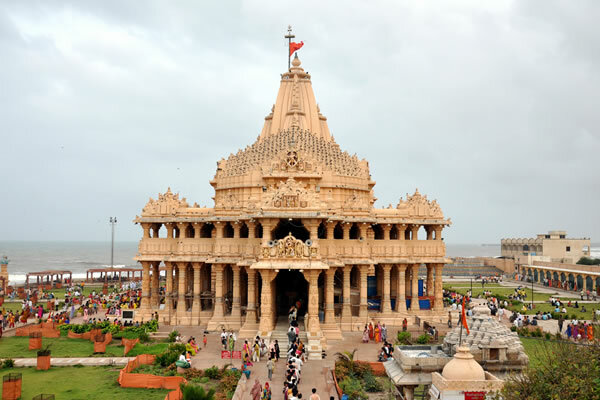 Somnath temple located in Prabhas Patan near Veraval in Saurashtra on the western coast of Gujarat, India, is ancient among the twelve Jyotirlingas of Lord Siva. Infact, it has been mentioned in vedas and puranas. Skanda Purana, in a chapter on Prabhasa Khanda, describes the emergence of Somnath Jyotirlinga. This purana also describes the Sparsa Linga of Somnath as one bright as the sun, the size of an egg, lodged underground. The Mahabharata also refers to the Prabhasa Kshetra and the legend of the moon worshipping Shiva. Infact, south pole and antarctica were also mentioned in Uttara Rayamana, long back. Mahabharata describes Somnath as a city south of the confluence of River Saraswati to the sea. Infact, Somnath was a triveni sangam (cofluence of 3 rivers) of rivers Kapila, Hiranya and Saraswati. Lord Krishna met his end in a place called Veraval, which is near Somnath. Arjuna is said to have performed the last rites of Krishna at the confluence of rivers Kapila and Hiranya. Rig Veda also mentions about this sacred place. It was called Bhairaveswar in Satya Yuga, Sravanikeswar in Treta Yuga and Srigaleshwar in Dwapura Yuga. Somnath Temple was first built with gold by Moon God in Satya(Krita) Yuga, with silver by Ravana, in Treta Yuga, with sandalwood by Lord Krishna in Dwapara Yuga, and about 2500 years ago by The Great King Emperor of Jambudwip Shri Vikramaditya of Ujjaini fame , The second was built in the period 480-767 CE by the Vallabhi kings. This was again replaced by the Pratihara king Nagabhattta II in 815 CE and with sand stone by Bhimdeva Solanki, Gurjar Ruler of Gujarat. Sommanth was a port city, and an important center for economic activity, as it was connected to West Asia and Africa. The Chinese traveler to India Hiuen Tsang, is known to have visited Saurashtra area between 641 and 644 CE. According to Tsang’s observation, Somnath was a thickly populated city that had huge establishments of religious and economic activities. His notes describes the Temple, bright Siva Linga and geographic location of this place. Dandin’s Dashakumaracharita, mentions a prosperous trader from Somnath, who had well-equipped ships to assist his trade. The Arab writer Jaun-ul-Akbar of 11th century CE says while describing Somnath, “On the coast of Hindustan lies a big city named Sammath (Somnath), It is as important to Hindus as is Mecca to Muslims.” The 13th century CE traveler Marco Polo has noted Somnath as a huge center for trade and religious activity. The first temple was believed to have existed at the start of the Common Era. This temple is supposed to have been built by wood/bamboo. Around 649 CE the Maitrika kings of Vallabhi Gujarat, re-built the worn out centuries old temple. In 724 CE, Junayad was appointed as the governor of Sindh region. In 725 CE Junayad marched along with his army towards Marwar, Barauch, Ujjaini, and Malwa. He defeated the armies of Vallabhi. Merutunga’s work Prabandha Chintamani, a early 14th century CE work mentions the fall of Vallabhi into hands of invading Arab armies. The first major damage to Somnath temple happened during this time. The temple was renovated by Chalukya rulers of South Gujarat after the Arab armies receded. Nagabhatta II of Pratihara Dynasty was ruling over Kanauj during 815 CE. He worshiped Shiva at Somnath during his journey in Gurjara. 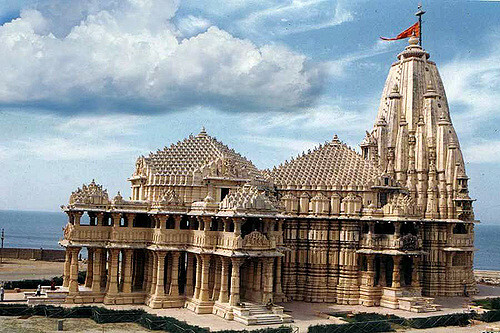 Nagabhatta II expanded the Somnath temple into a huge complex built of red-sand stone. Graharipu had become the default ruler of Gujarat after the fall of Pratihara dynasty and Chalukyas in Gurjara. In 942 CE, Mularaja, commander of a small area called ‘Sarasvatamandala’ defeated Graharipu and captured Anhilawada (Patan). Hemachandra, the Jain poet who lived about a century after this period refers to Mularaja as the ‘Architect of Gurjara.’ There is also a legend which points to Mularaja as a descendant of Chalukyas. Mularaja was a devotee of Shiva and during his reign the Somnath temple is known to have gained prominence. Mularaja defeated Sapadalaksha, the ruler of Kutch, and ruled over most of what is present day Gujarat for about fifty years till his death in 996 CE. The rule of Mularaja and the prosperity of his kingdom are also mentioned in other literary works of that period like Kirtikaumudi, Vasanatavilasa, and Sukrtasankirtana. The Somnath temple had undoubtedly become rich and prosperous by the turn of the millennium. Mahmud Ghajini reached Somnath on 6 January 1026 CE. He broke the shivalinga into two pieces and killed thousands of unarmed devotees who came forward to protect the temple. Bhimadeva of Anhilawada reconstructed the temple in later part of 11th century. In 1164 CE, Bhavabrhaspathi requested Kumarapala (who converted to Jainism) to rebuild the Somnath temple. These ruins remained until Sardar Vallabh Bhai Patel started complete reconstruction process in 1947, post Indian independence. The Veraval inscription of 1264 CE describes the rule of Arjunadeva. It also states that during this time Amir Rukunadin was ruling the Arab coast. Nora-din Feroz, a trader, with the blessings of the pashupatacharya of Somnath, built a small masjid on the outskirts of Somnath. Ironically, during the same time the Muslim rulers of North India were ransacking temples and building mosques over it. In 1393 CE, Zafar Khan, Thuglaq’s governor to Gujarat, destroyed the temple. Ahmed Shah changed the capital from Anhilawada to Karnavati and named it as Ahmedabad. In 1459, his thirteen-year-old grandson became the sultan with the name Mohammed Begada. In 1467, Begada defeated Mandalika of Junagadh but the latter continued to worship Somnath. Enraged by the continuing worship of Somnath, Begada attacked Junagadh and defeated Mandalika in 1469. Mandalika converted to Islam after his defeat. 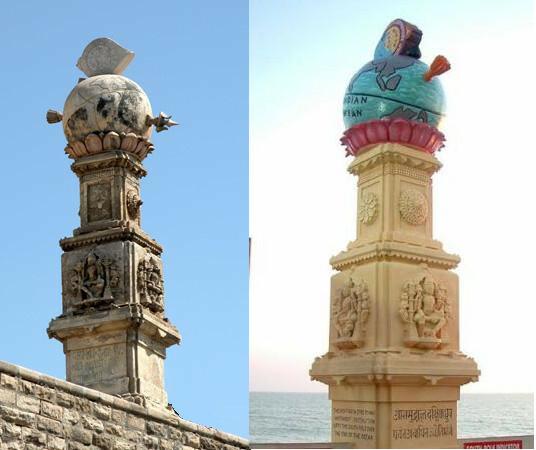 Begada threw away the linga at Somnath and converted it into a masjid. Most of the Islamic architecture into the structure was added during this period. Due to the constant threat of attacks by invaders, trade shifted from Somnath to Surat. During the early 16th century, the temple was raised by the people of Somnath and worship continued even during Akbar’s rule. In 1675, Aurangezeb ordered Mohamed Azam, the governor of Gujarat, to damage the Somnath temple in order that it could not be renovated and used for Hindu worship. The Marathas exerted pressure on the Moghuls in late 17th and early 18th century. Aurangzeb destroyed the temple structure at Somnath in 1706. But Damji Gaikwad captured Somnath subsequently. The temple structure had become weak so the worship started in a small temple just outside the town. In 1783, the Rani of Indore, Ahaliyabai Holkar visited Somnath. She was depressed at the state of the temple structure at Somnath. Since the temple was not fit to use, she built a temple just a few meters away, which stands to even this day. To avoid the chances of the linga being broken down, Ahilyabai installed the linga in a cellar on which the temple was built. In 1800, the whole of Saurashtra came under the Gaikwads of Baroda. The Gaikwad dynasty continued to worship Somnath. But in 1820, Jungadh fell into the hands of British and the Nawab of Junagadh pursued the British to levy tax on visitors to Somnath. The Gaikwads of Baroda protested this move and the British recalled the tax. After Nawab of Junagadh escaped to Pakistan in 1947, On kartika shuddha padya (November 1947), Sardar Patel visited Somnath and was moved by the state of the temple. He along with Jam Saheb, went to the sea shore, took the water of sea in his hand as the witness to his oath and promised that he would rebuild the Somnath temple. Nehru opposed Patel by saying “I don’t like your trying to restore Somnath temple. It is Hindu revivalism.“. Gandhi wanted Patel to build Somnath, but not with government money. Funds were raised and finally, installation ceremony of Siva Lingam was set on 11 May 1951. The temple construction was done in the Chalukya style of architecture. Built with sandstone, the shikara (dome) of the temple is 15m high and has a 8.2m flag post on top. It is only historical justice that the temple built by Kumarapala in 1164 CE was also built with sandstone. Translation : Somanath in Saurashtra and Mallikarjunam in Srisailam; Mahakaal in Ujjain, Mamleshwar in Omkareshwar; Vaidyanath in Paraliand Bhimashankaram in Dakinya; Ramesham (Rameswaram) in Sethubandh (bridge on ocean), Nagesham in Daruka-Vana; Vishwa-Isham (Vishvanath) in Vanarasi, Triambakam at bank of the river Gautami;(Godavari) , Kedar (Kedarnath) in Himalayas and Grushnesh (Gushmeshwar) in Shivalaya (Shiwar). One who recites these Jyotirlingas every evening and morning, is relieved of all sins committed in past seven lives. One who visits these, gets all his wishes fulfilled and one’s karma gets eliminated as Maheshwara gets satisfied to the worship.